This punch will have it’s variations depending on personal taste, for example, instead of using sugar, some will opt for condensed milk, so in the end, you use less evaporated milk, but,you may have to add water because the condensed milk is very sweet. Other things I’ve tasted in different fig punches were essence (vanilla or pear or mixed essence etc.) and cinnamon. So you see the world of opportunities exist, when making fig punch. One thing to note is that fig punch changes colour after a while, it changes from white, like in the picture, to a cream colour. With this change in colour I find that the punch tastes sweeter than when it was first made. That’s a phenomenon I can’t explain, so when I make fig punch I try not to make a lot, just enough. Anyhow, I’m talking too much, here’s Fig Punch “trini style”. 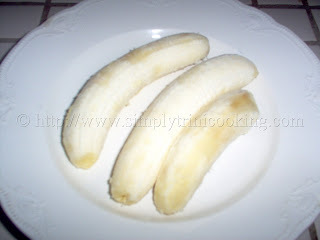 Peel the banana and chop before placing it in the blender with the liquid milk. 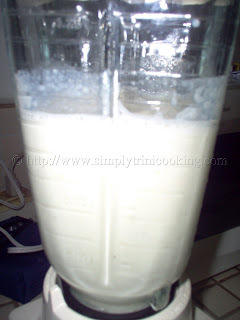 Blend the liquid milk with the chopped bananas until smooth. 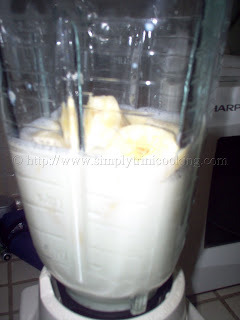 The banana and milk is blended smooth. 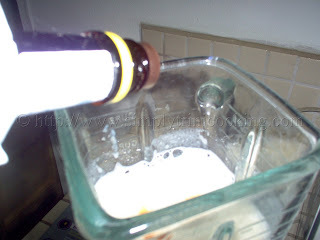 Add the bitters and again blend for a minute. Add sugar to taste and blend again for another minute. Although it’s true that I said that the recipe was my simple way, you realize that I like Angostura bitters in my punch. But then, the amount I use, I don’t really taste it! Hope you enjoyed the post. As always, keep the comments and questions coming, it is a pleasure to read your emails. I have to go now, I have a ton of work to do. Bye! I’m originally from St. Kitts and banana drinks was quite common gowing up where banana was probably the number one fruit consumed. Here is one of my favorites. 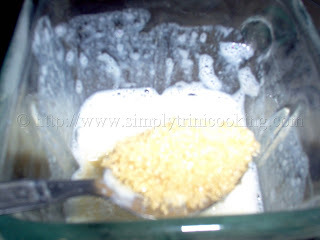 Half a blender full of ice, 3 -4 ripe bananas and half a can of well shaken cream of coconut. Blend until ice is well blended. 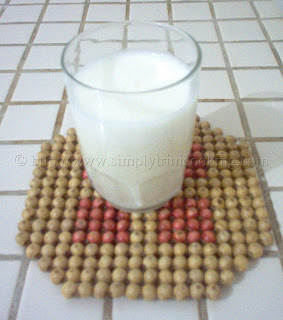 I always new it as Caribbean Banana milkshake but I’m curious if the recipe is familiar to you, if so by some other name? That is a new one for me but sounds delicious. Thank you for your comment. This is one of my favorite things to do with over ripe bananas instead of throwing them away for the birds. My recipe is a bit different thou enjoy! blend all together and serve with ice, enjoy! PS: One time I went over board and added a few spoons of peanut butter, delicious! You can as well add nuts if you like.